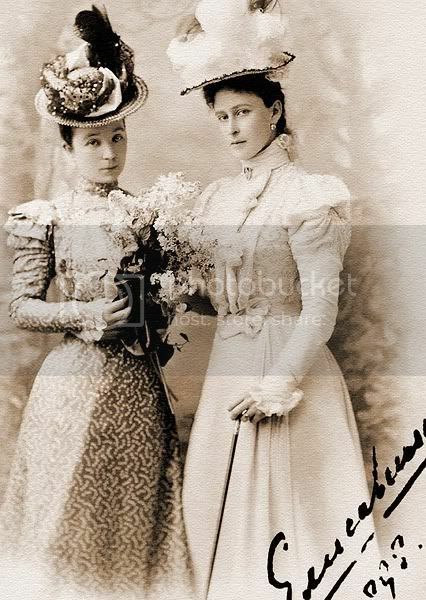 I am searching for information and fotographs of all the ladies in waiting, maids of honor etc who served Empress Alexandra Feodorovna and her sister Grand Duchess Elizaveta Feodorovna (Ella). if you are still interested in those ladies (of Elizaveta Fedorovna) I can provide information. Recently I've done a research on GDss' suite and her ladies and posted this info in my livejournal, in Russian. It would be fascinating to know brief biographies of those ladies.Didnt Countess Olsufieva later as a emigree in Berlin write a memoir of Elizabeth? Countess Olsufieva indeed wrote a short memoir-bio on GDss Elizaveta. As well as Maria Troubetzkaya (married Count Belevskiy-Zhukovskiy), another lady-in-waiting of the GDss. Some info on Countess Olsufieva. Alexandra Andreevna Olsufieva was the GDss' third and last Hofmeisterine. She was appointed as the Hofmeisterine in 1891 year, the year the Grand Ducal pair moved to Moscow. The Countess' predecessor Princess Golitzine resigned as she was a Catholic - such thing could bring many problems in patriarchal and highly-orthodox Moscow. Alexandra Andreevna Miklashevskaya was born in 1846, married Count Alexei Olsufiev (he was her own Uncle!!) and had 2 sons - one of them was and ADC of GD Sergei. She was a much-respected person within the Grand Ducal court, though her husband - a dashing hussar - sometimes disturbed the Grand Duchess with his manners. 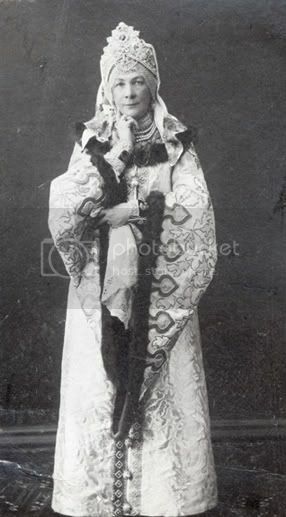 Felix Yousupov mentions the Countess in his memoirs - he says that she looked like a marquise from the XVIII century. I guess he meant her manners and education. Alexandra Andreevna was faithful to her mistress even after GD Sergei' death and after 1909 when the GDss dissolved her court forever. The Countess had a chance to leave Russia in the revolutionary years and died in 1929. What a great thread ! Svetabel , you must know the GD EF lady in waiting nicknamed Mashka? She was a huge woman known for her huge size, booming voice and great physical strenth...I have wondered if she was why Marie N. got that nickname as well. Since Marie's sisters called her " fat little bow wow" , it's quite possible they first used this lady's nickname for Marie as a joke as well. I am a bit puzzled about this. If the Orthodox Church won't marry first cousins, surely they would not marry an uncle and niece. Was the husband an uncle by marriage? That is within the Prohibited Degrees of the Church of England, but maybe the Orthodox are different. Actually they called her Masha. You speak about Maria Alexandrovna Wasilitchikova - she was not in fact a lady-in-waiting of the GDss. 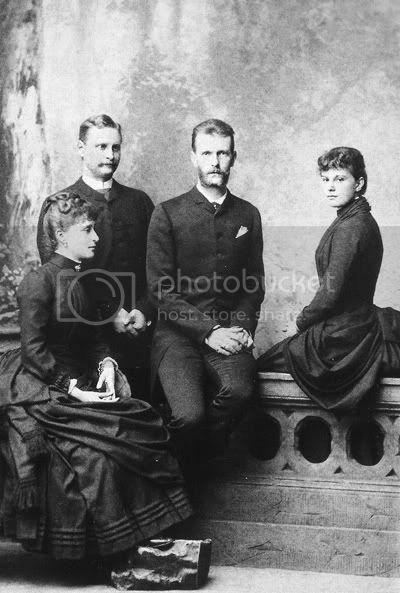 She was a l-i-w of the Empress and in 1886 was sent to EF 'to fill the gap' as the GDss' first l-i-w Princess Lyudmila Lobanova married GD Sergei's ADC Konstantin Balyasniy. The newlyweds left the Grand Ducal court and the GDss began to search for a new l-i-w. While she was searching Masha was her companion in Ilinskoe - after that they became great friends until 1915 year. 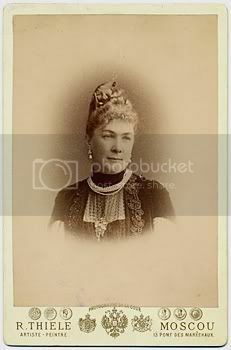 Princess Alexandra Nikolayevna Lobanova-Rostovskaya, another more or less famous l-i-w of the Grand Duchess, can be seen in many memoirs of her contemporaries. She was very vivid, lively and eccentric person. She was born in 1868 year in a large family, whose male members very often were diplomats, ambassadors, ministers, and women form the family often found their husbands within the diplomatic corps. In 1889 year Alexandra - her nickname was Fafka - became a l-i-w of GDss Alexandra Georgievna and after her death she didn't left the court but became a l-i-w of GDss EF. She resigned in 1902 year (the reasons I still can't find) - she never married and often lived with the family of her eldest sister Lady Olga Egerton (whose husband was a minister in Greece and Vatican). The sisters continued to be together after the death of Olga's husband and lived in London, where Fafka died in 1946.Olga Egerton moved to the USA and died there in 1947. Fafka was indeed an eccentric person as every memoirist who mentions her writes about her jovial character, funny jokes and endless chatting. There is also an interesting fact about Fafka - when I was beginning my research on the Grand Ducal courtiers I realized that in every source (Russian or English) Fafka is mixed up with her cousin Lyudmila Lobanova - first l-i-w of the Grand Duchess. Even Mr.Warwick in his bio on the GDss EF writes about Fafka's being a l-i-w in 1885 year...no...it was Lyudmila. and in 1885 with the GD pair and her future husband Konstantin Balysniy. Thank you, Svetabel, for these informations and precisions. Even if it is probably the subject of another thread, could you provide more information about Baliasny? Wait, Fafka if didn't become lady-in-waiting in 1885 (that was Lyddy), then why is she in the picture with the GDss and the GDk? Sorry, what picture? If you speak about the last photo in my previous post - there is Lyudmila, not Fafka in the picture. Thomas, did you mean Princess Elizaveta Nikolayevna Obolenskaya (1864-1936) ? GDss Elizaveta was also on friendly terms with Princess O., at least I've found in the Archives postcards and letter sent to Obolenskaya by the GDss. I've seen a note by Alexandra F. written to Prss O. (I mentioned it in the topic about Empress Alexandra's handwriting).